Environmentalists and nearby residents say they believe We Energies is blowing smoke after reviewing independent data on the impacts of the Oak Creek Power Plant. But officials with We Energies, which serves southeastern Wisconsin, insist the plant does not cause adverse impacts to the community, though they pledge a review of its operations in the future. 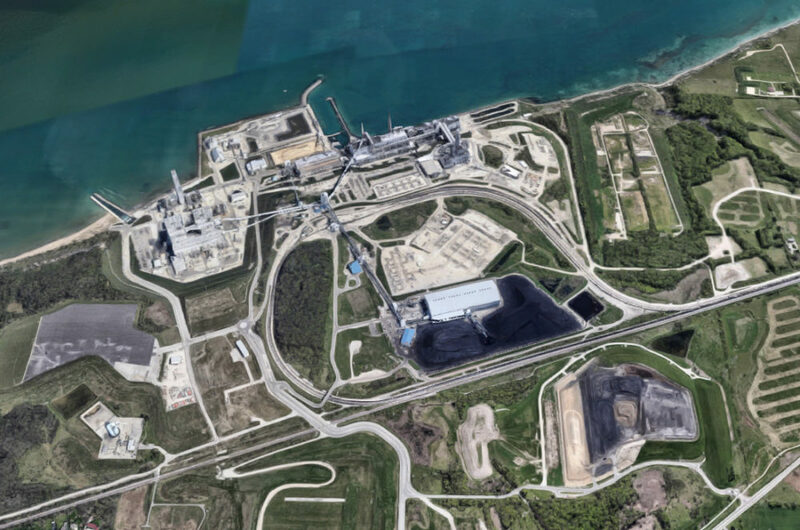 Although concerns about the plant, on the far southeast corridor of Milwaukee County, and its impacts on the surrounding area have been ongoing, the flames of controversy were fanned recently when black coal dust was discovered beyond the plant property. Earlier this month, residents living in close vicinity to the plant discovered coal dust covering homes, cars and a playground. Testing from a firm, Aspen Consulting, linked the dust to the plant. Several organizations — including the Clean Power Coalition of Southeast Wisconsin and the Environmental Accountability Group — held a news conference in the days following the discovery. The event also gave nearby residents a sounding board. Amy Jahns is a senior communications specialist with Milwaukee-based WEC Energy Group, the parent company of We Energies. In an email in response to Urban Milwaukee’s request for comment on the latest concerns, Jahns said the utility is reviewing the protocol at its Oak Creek facility. The discovery of the coal dust also has added renewed fuel to the ongoing debate about coal power and whether it should be replaced or de-emphasized in favor of other alternative energy sources, such as solar power. Jahns in the email said We Energies and WEC Energy Group continue to believe that coal power has not been linked to adverse health conditions. Groups such as Clean Power Coalition of Southeast Wisconsin and the Environmental Accountability Group, however, beg to differ. Organizers within the groups say studies have found coal dust contains such toxic metals as lead, mercury and arsenic. Inhaling particulate matter, the organizers say, can aggravate asthma, respiratory symptoms and increase hospital emissions. Furthermore, the groups note, coal dust can lead to increased mortality from cardiovascular and respiratory diseases, as well as lung cancer. Wisconsin is more dependent on coal than all but nine states and a big contributor is We Energies, which gets 51 percent of its power from coal. The company recently announced it will shut down its coal-fired plant in Pleasant Prairie, and rely more on solar power, but would continue running its newer coal plant in Oak Creek. Dana LaFontsee, spokesperson with the Clean Power Coalition, says the latest incident is a call to action. She and others within the organization are imploring people — across the Milwaukee area — to seek out changes. “Lives depend on it,” LaFontsee says. Sort of like complaining to the farmer that the crops growing in the nearby field is producing allergens that make me ill. Or complaining that living by the airport interferes with my sleep. Goes with the territory. Those who can’t tolerate such things can move, right? Or like if your neighbor is burning a pile of tires in their backyard. The upsets neighbors should just shut their pie hole and cover their face with a rag like the rest of us. There are dust dampening methods and coatings that can be placed on coal piles that form a crust. And on windy days, keep movement on coal piles to a minimum. There are air quality tests that can be conducted on operations. Dust has many sources, soot from diesel trucks, brake and tire dust, salt dust, construction dust, agricultural dust laden with herbicides, pesticides, and fertilizers. Soot from the transportation industry is less than 0.5 microns in size and can be sucked deeper into the lungs creating more havoc. Dust size is an issue that could be further explored. During the past decade, dust control methods have been neglected in Wisconsin especially in the construction and transportation industries. Dust is visibly seen billowing from sites and off dump trucks without control. Freeway construction has loads of dust. Jimbo must feel there is something like “clean coal” which does not exist. And of course the neighbors were there first. Sam Johnson from SC Johnson fame, spent $$$$$ fighting this and lost. David is right but his post isn’t the issue here. This call ould have been avoided if, as a condition of employment, Gene Klappa had been forced to live in close proximity to the coal plant he just had to have. This will shake out someday when the plant is forced to convert to natural gas; paid for by you and me. Spokesperson Jahns should be asked to explain a LOT MORE about what is causing the incidents, and what is being done to prevent their recurrence. I’m shocked that WE Energy’s new coal burning billion dollar plant that was supposed to be the clean burning. People WE Energy’s pulled another big fat lie and charged the customers for this big dinosaur outdated plant.